BOOK REVIEW by Sabne Raznik: Tomorrow Yvonne, Poetry & Prose For Suicidal Egotists by Yvonne de la Vega – Yvonne de la Vega was here. The following review was originally posted at Yahoo! In literary mythology and legend, poets were beings of a lofty kind. They were prophets, messengers of the gods or at least of the times. They were eccentric, crazy, lonely, fools, and wisdom personified. They were terrifying and compassionate, cold and warm, dazzling and puzzling. They went through the worst life had to deal out so as to sing of the most beautiful. But after 1914, two World Wars, Modernism, the bloodiest century in history (the 20th), followed quickly by what is stacking up to be an even more harrowing one (the 21st), we’re all grown up now. We don’t believe the stories. Our poets today are not heros with hearts closer to divinity. They are as dirty and ordinary as we are. And we treat them accordingly. Yvonne De La Vega both embraces this notion and challenges it in one breath. Her debut collection (which is also her Collected Poems) titled “Tomorrow, Yvonne: Poetry & Prose for Suicidal Egotists” is a thick volume full of surprises. The language is ordinary, sometimes in the gutter. The rhythms are those of Spoken Word poetry – lending itself more to audio than to text. And indeed, up to now, that is how De La Vega’s poetry has been presented and enjoyed. She is a lady of the street and of the moment, of seedy hangout joints and alleys where nothing much has changed but the drug in vogue. She can tell the stories of folk we tend to overlook: the homeless, the down-and-out, the never-had-glory-days, the castaway veteran, the bewildered immigrant, etc. But she also carries the lofty calling: declaring that poetry without a purpose isn’t poetry at all, that the war between good and evil is real, implying again and again that somehow she is meant by some higher power to write, and even reporting from the front lines of the Occupy Los Angeles Movement. This book is larger than life, like the city she writes from. De La Vega has a stated passion for jazz and her poetry reads like jazz, particularly when read as a whole as this book allows. Free-form like water and hard to take in all at once – that’s Yvonne De La Vega. Eccentric, crazy, lonely, terrifying and compassionate, cold and warm, dazzling and puzzling, a witness to our times, and as ordinary as your neighbor. Somehow, she’s all those contradictions. 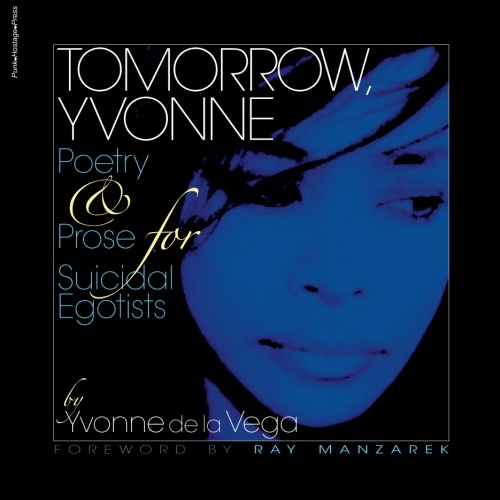 “Tomorrow, Yvonne: Poetry & Prose for Suicidal Egotists” is a contemporary answer to the literary legend.